In this brilliant discussion with George Noory on Coast 2 Coast AM, intuitive researcher, lecturer and filmmaker David Wilcock discusses his recent research on crop circles and energy vortexes. According to the work of Ivan Sanderson, there are 12 points (or 'Vile Vortices') around the Earth where ships and planes disappear, not just the Bermuda Triangle. Storms tend to begin in these areas, which also exhibit gravitational anomalies and magnetic fluctuations. These points, via particles and vibration, affect the geometric shape of the continents and the atmosphere, Wilcock detailed. This past July he traveled to England to observe crop circles first hand, including one formation that was octahedral in shape. While agreeing that some circles are human-made, he noted that researchers have found the soil under crop circles to have drier, looser consistency than the soil near by. Crystals have also been found in the crop circle soil, which could only grow at temperature levels that would normally be much too hot for the plants to survive, he said. "The reason why these crystals are forming and the soil gets so dry is that the technology that makes these circles involves drawing water up out of the ground," Wilcock suggested. 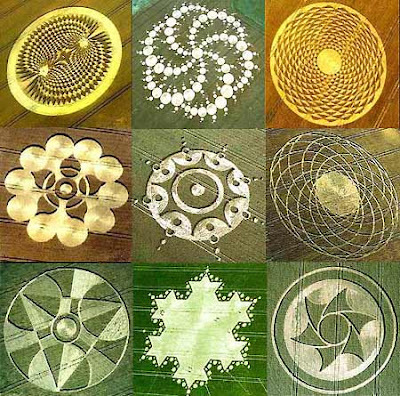 He connected the patterns of crop circles with the geometric processes of the Earth's vortexes. Further, some of the crop circles' symbolic messages have related to DNA change and soul evolution, as well as the downfall of the New World Order, he said. For more on Wilcock's work, check out his lecture 2012 Event Horizon. First hour guest, UFO expert Nick Pope reacted to the news that Winston Churchill covered up a UFO event because he feared mass panic in the UK. The incident, said to occur during WWII, was revealed as part of Britain's continuing release of formerly classified UFO files. However, Pope pointed out that this report was more of an allegation, and there was little documentation to back it up. 2012 & The Crop Circle Connection ! David wilcock is really one of the best spokespersones for this socalled new age thinking since he links up all different parts of revolutionizing discoveries and backs it up with scientific approach which correlates perfectly with the spiritual one.